This is a hard one for us, as views from any beach in Goa are postcard-worthy. Each beach has its own charm, and they all have some amazing shacks and restaurants where you can sit back with that beer and watch the sun go down. But if we have to pick favourites, these will be it. This is a local hangout near the Dona Paula stretch that sits atop a cliff, giving you some Insta ready photo ops. And if that is not enough, then indulge in their food, live music and sun soaked evenings. Their Goan fare is delicately done (that Xacuti is yum) and we can look at the expanse of water that stretches endlessly, for hours. And if you got a special occasion, book yourself a cosy cabana, pop open a champagne and enjoy the evening. This all-year-round shack on Colva beach offers sweeping views of the sea and the beach. Crystal clear waters and lesser crowds than the other north beaches are additional incentives to make a trek here. In fact, Colva beach offers beautiful sunsets and Boomerang ensures that you can sit there and soak them all in. To keep things lively, they host karaoke and live music nights and of course, their amazing (and affordable) seafood and cold beer is always there for good company. Thalassa has moved from its legendary Vagator spot to a quieter, more unexpected spot in Siolim. We've been itching to go back here and enjoy their sangria and Greek salad but are yet to make a trip. And guess what, the folks promise us that the views at sunset are equally stunning because it overlooks the juncture where the river meets the sea. Sigh... Can't wait to re-live the nights with fire dancers and that lovely Thalassa vibe. Agonda beach in itself is one of the nicest beaches in Goa making it super hard to pick a scenic, beach-facing restaurant that's better than the rest. After a lot of introspection (and tough competition between H20, Simrose, White Sand and Jojolapa), we decided that White Sand was our favourite. Their garden setting is such that it cocoons you in a small green space where you hear the sound of the waves at all times. If you want to get even closer to the beach, park yourself at their sunbeds and order their smoothies and calamari. This hidden gem at the mouth of the Mandovi river (when it opens in to the sea) offers an amazing view. Come low tide, you can see the crabs skittering about over the rocks. But come high tide, especially in the monsoons, you can watch the sea churn and spray you with its foam whilst you sit here and enjoy their scrumptious seafood. If this sassy shack is good enough for Bollywood, it's good enough for you. Right? 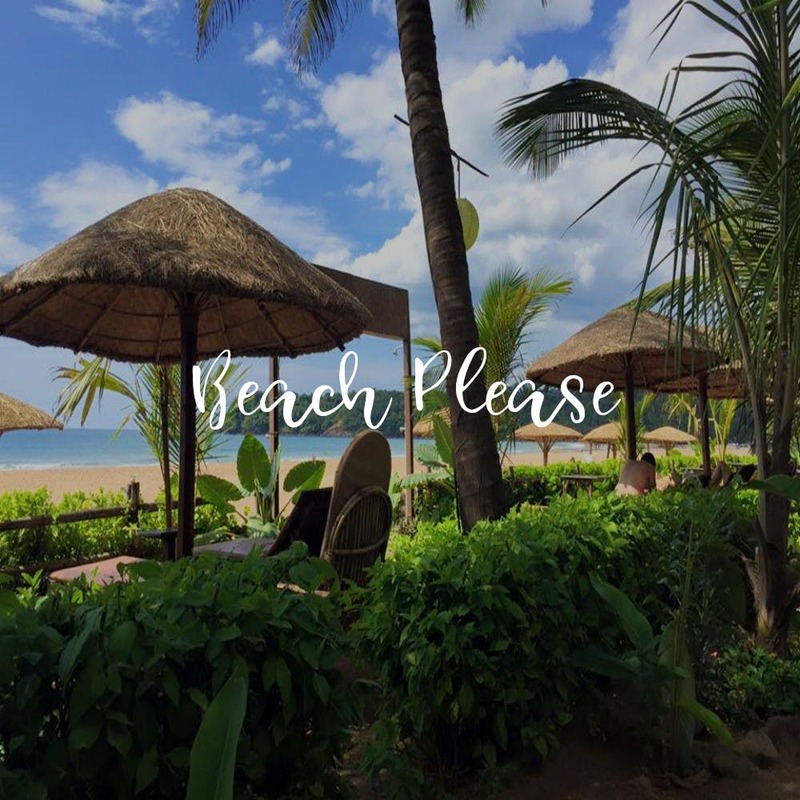 We love that this is tucked away in a quiet lane on Calangute beach (yes, a quiet spot exists) that's not crammed with tourists. Their forte is Goan food and their service is infinitely better than most of the neighbouring shacks. Brownie points for Joshua (the owner) and friendly doggos, Chai and Biscuit, who make a meal here pretty darn memorable. Although that restaurant stretch on Anjuna beach isn't our favourite part of Goa, there's but one cafe that always calls us back. If you're a brunch person by the day and wine lover by the evening, pick this laidback spot to enjoy the beach. With its all-white decor, chill music and boho character, it wins hands-down in terms of location. And hey, you can literally walk down a few steps and be on the rocky beach. The only downsides? It shuts around 8pm and is mostly vegetarian (they do have eggs though). On the same Anjuna stretch as Eva Cafe, lies Purple Martini on one end. Now, if you like a more party vibe and are a sucker for sunsets, this one's perched on a cliff and has some spectacular views to offer. Their cocktails are yum, the bar snacks (and Continental fare) are on-point and it's usually buzzing. Our two cents: Go on Saturdays to enjoy live saxophone (and the golden hour light). This fancypants beach lounge on Mandrem beach is a stunner. Sit by their pool and enjoy a drink or walk over to the beach and go for a long swim. The place is best enjoyed in a group and we'd suggest making a day of it here. Order yourself some seafood and see the dusk unfold like a dream. Palolem beach that's packed with shacks might have been lovely if there weren't hordes of tourists around. This is why, we prefer walking in the opposite direction towards what (to us) looks like the best spot in Palolem for sunsets and beach views. Meet Sundowner, an island bar that's got views on both ends to die for. We've heard stories of people who've walked up here and have taken a boat on the way back thanks to the alcohol and the high tide. Go here for pizzas, cocktails and bonfires by the beach. This beach club that's plonked right on Vagator beach was a crazy party place once. In a recent turn of events though, they announced that they were going to be as much of a breakfast and lunch place. So, hop over for a boozy Sunday brunch with bae over live music or set the tone for a lazy, beautiful day by opting for their yoga class, following that up with granola and smoothies. Either way, you're going to be very close to the beach and both the mornings and sunsets will be a sight to behold. This new Pan-Asian beauty, overlooking Vagator beach is actually on the hilltop, making it an amazing vantage point to admire the sea. Order yourself some dimsums and whiskey sour (their cocktails are ace) and teriyaki beef and just watch the sun go down. It's a beautiful hideout if you want to sneak in some we-time we bae as well. Want additional incentive? They host ladies nights and have live music pretty often (follow them on Facebook to be in the know).